As we plan and prepare to build our house in Nevada this summer, I feel that we are quickly unbuilding our home here in Oregon. We already sold off a lot of the larger pieces of furniture. We are having a yard sale this weekend to hopefully get rid of the bulk of everything else we have stacked in the garage. 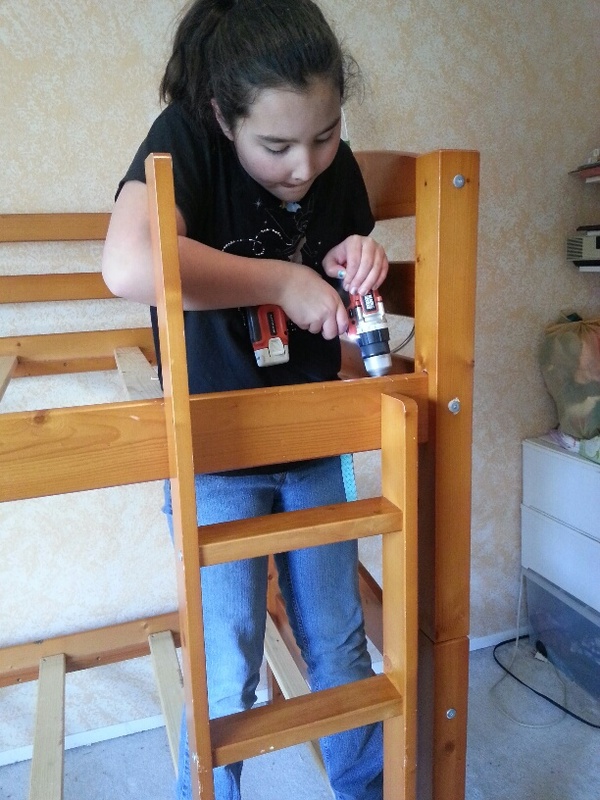 The girls’ bunk bed is dismantled in the garage waiting to be sold. Princess Girl took the whole thing apart with very little help from us. She is going to be such a huge help when we build! 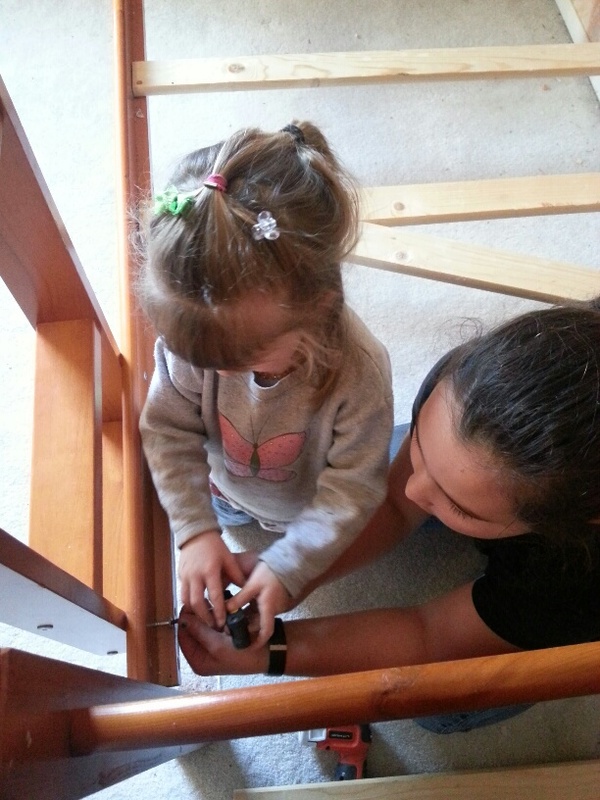 She even patiently let Flower Girl help with a couple things. 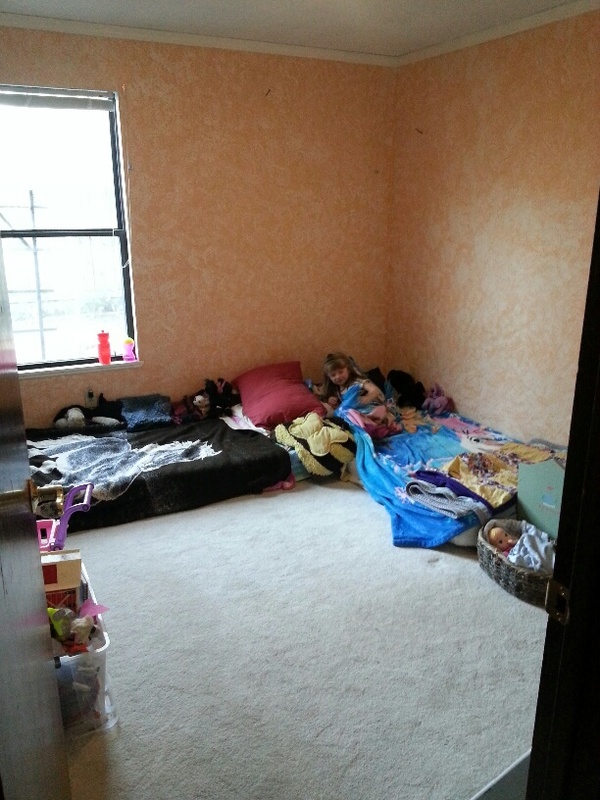 So now the girls are sharing one dresser (the other is being sold) and sleeping on their mattresses on the floor. The living room has a couch and coffee table in it. Nothing else. And the coffee table is going bye-bye this weekend. The dining area has a table, but no chairs. 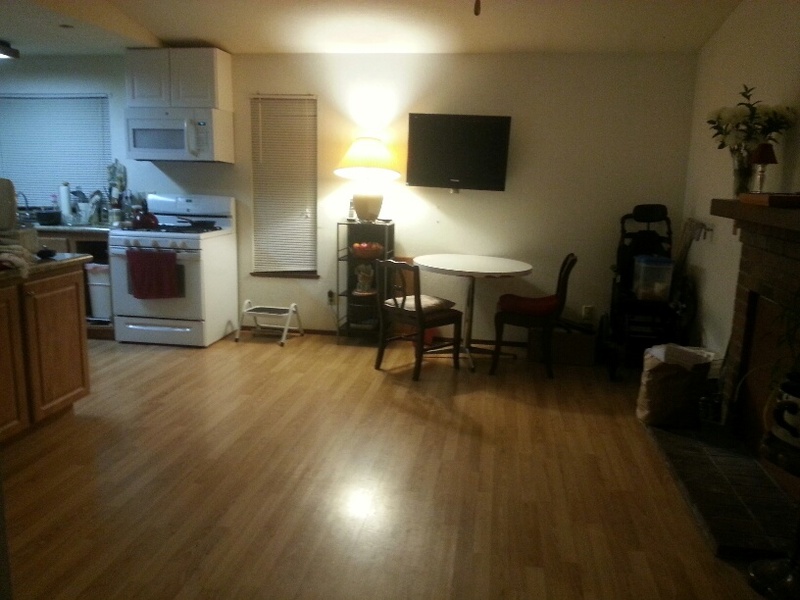 The family room and kitchen are the most furnished rooms in the house, since we do still have to live here. But even they are sparse. And it feels good! Not just the knowing that we are returning home soon, but the emptiness itself. The space. The uncluttered feel. When our family of 4 moved in with Bachan and Pagee, we had to fit our stuff in on top of their stuff. I needed an area for school/crafts/work, so we squeezed it into a corner of the living room. It worked, but it sure felt cramped. Since Hubby works from home, he uses our bedroom for his office, which means his desk, etc is in our bedroom. It works, but it sure feels cramped. And since he takes up extra space in the bedroom, there’s really no space for any of my stuff. So I keep all my clothes in the girls’ room. It works, but, you guessed it, it sure is cramped. So as we downsize our lives once again to fit into 240 square feet, I am once again reminded that we often carry around too much extraneous stuff in our lives. And that the more space you have, the more you fill it up. So, once again, I am finding the downsizing process liberating. And while most of the stuff being sold in the yard sale is Bachan and Pagee’s, there are quite a few item of ours as well. And it’s all rather exciting since it means we are moving soon! This entry was posted in Building a Home, Homemaking, Newsy Stuff, Portland Interlude 2014-2016, Skills and tagged Family, Homeschool, Homestead Kids, moving, skills on March 18, 2016 by Maridy. Oh my – moving day must be coming soon! When we did the same thing – sold off most of our things so we could live in our travel trailer while we build our new home – I promised myself I would never keep so much clutter ever again! It’s amazing how much junk we had and downsizing was a very liberating feeling! We spoke with our excavator/concrete foundation guy today – we break ground in exactly 1 month – April 18th! Wahoo! That’s so exciting, Vickie! We are digging a test trench this coming week. If all works out, we can then submit our plans for our permit. And we hope to be back in NV in about two months!